The department Research and Development of Weather and Climate models (RDWK) investigates and develops research tools for weather and air quality prediction applications and climate models. We work on detailed physical processes, data assimilation, long term climate projections and practical applications including storm surge forecasts and statistics of extremes. RDWK participates in a number of international projects directed towards a variety of weather and climate related research and development areas and acts as the Netherlands Focal Point to the IPCC. RDWK is structured in 3 clusters: Mesoscale modelling develops tools for regional numerical weather prediction (NWP) and climate analyses; Large scale modelling focuses on global climate and atmospheric chemistry; Postprocessing and Analysis develops statistical analyses, applications and climate services. RDWK consists of about 45 research professionals (including PhD and technical support staff). We have a strong international network, and most activities are executed in collaboration with partners in e.g. HIRLAM/Harmonie, EC-Earth, ECMWF and universities. Contracts from Rijkswaterstaat, Ministry of Infrastructure and Water Management, funding organisation NWO, the European Copernicus program and European research programs provide roughly half of the annual portfolio. The other half is basic funding for servicing the weather forecast centre, climate scenarios and strategic research. Some recent and ongoing activities and projects: development of the NWP model system Harmonie, and its tailoring to the needs of the KNMI Early Warning Centre is embedded in the HIRLAM consortium work program, and focuses on data assimilation and ensemble prediction. The KNMI’14 climate change scenarios will be followed by a new generation of generic and specific scenarios in the timeframe 2018-2020, focusing on future weather applications, urban scenarios and sea level rise. Contributions to the international EC-Earth program focuses on the development of high resolution projections and the coupling of atmospheric chemistry in the Earth System Model configuration. 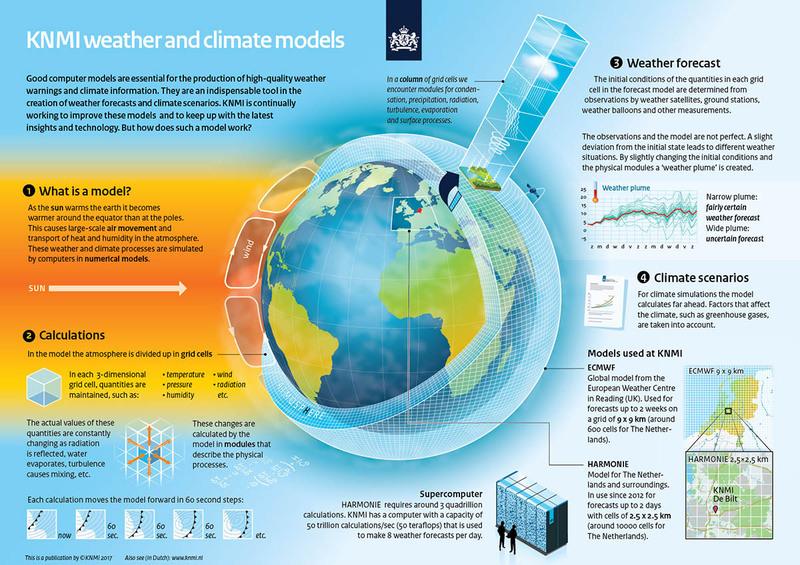 Observations and climate models are used to attribute causes of past climate change and extreme weather events. The KNMI Climate Explorer is a web-based climate data browser, used by many students, researchers and practicioners worldwide. Other research topics include air quality forecasting, extreme precipitation statistics, sea level rise, and evaluation of weather alerts. Extreme hydrological events such as droughts and floods can have devastating effects on people and nature. Researchers from KNMI and Utrecht University have worked together to create a unique dataset of combined climate and hydrological model simulations that can be used to investigate these impactful events. The first results were recently published in Geophysical Research Letters. Every winter the Netherlands hopes there will be another Elfstedentocht (Eleven Cities Tour). Scientists from KNMI and the Netherlands Environmental Assesment Agency (PBL) computed that the probability to have a period cold enough for an Elfstedentocht is now about 1 in 12 years, against roughly 1 in 5 years a century ago.